Microsoft® Word is the most widely-used word processor by authors. However MS Word is not just a word processor, it’s a desktop publishing tool with a myriad of features. Although it is incredibly simple to use as just a word processor it was never designed specifically to be a tool for producing ebook content, and so there’s a number of ways it can lead to issues when producing content intended for ebook conversion. 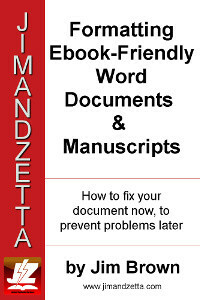 This book from JimandZetta.com gives you a step-by-step guide on how to avoid those issues when using MS Word as a word processor and make sure the content you are producing in MS Word is not going to lead to problems later when it is converted to ebooks! Whether you are a Word novice or a seasoned user, the ability nowadays to produce content that is ebook-friendly is almost essential. This guide will help you overcome the most common problems that using Word can result in – problems that just aren’t apparent in “normal” use of MS Word. For a few bucks you can make your life just a little easier! Currently available exclusively from Omnilit.com reduced from $5.99 to $3.99 during February 2016! Anthologies can boost your writing career. Authors who can produce—and publish—several titles a year improve their chance to have their work reach more readers over the author who spends years writing a single piece—and then takes several years trying to get it published. Publishing an anthology may be one of the easiest things you can publish because you don’t have to do all (if any) of the writing yourself! 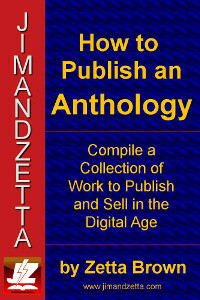 authors (or editors) who wish to propose an anthology idea—or is asked to be a guest editor for a publisher!